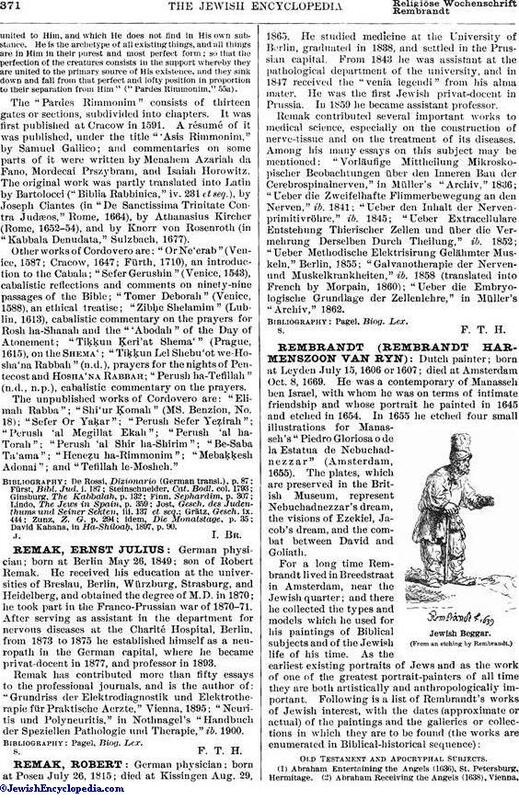 German physician; born at Berlin May 26, 1849; son of Robert Remak. He received his education at the universities of Breslau, Berlin, Würzburg, Strasburg, and Heidelberg, and obtained the degree of M.D. in 1870; he took part in the Franco-Prussian war of 1870-71. After serving as assistant in the department for nervous diseases at the Charité Hospital, Berlin, from 1873 to 1875 he established himself as a neuropath in the German capital, where he became privat-docent in 1877, and professor in 1893. Remak has contributed more than fifty essays to the professional journals, and is the author of: "Grundriss der Elektrodiagnostik und Elektrotherapie für Praktische Aerzte," Vienna, 1895; "Neuritis und Polyneuritis," in Nothnagel's, "Handbuch der Speziellen Pathologic und Therapie," ib. 1900.